Update: Webinar was successful. You can view my slides below and join the conversation on Kabissa’s website. You can also download the recording here (47Mb and 1 hour long). 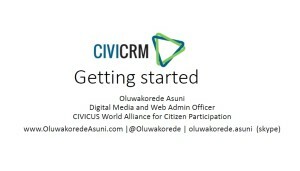 CiviCRM is currently the only CRM tool built from grounds up to meet the needs of civil society organisations. It is free. Open source. Web based. And works with Joomla!, Drupal and WordPress. CiviCRM is extensible and can be modified to meet almost all challenges that may be presented to it, and where there are cost implications, these are not necessarily as expensive as with proprietary software – and making it even better is the fact CiviCRM is supported by a community of developers who have written plugins (light weight self-contained software) to extend CiviCRM is certain new ways. 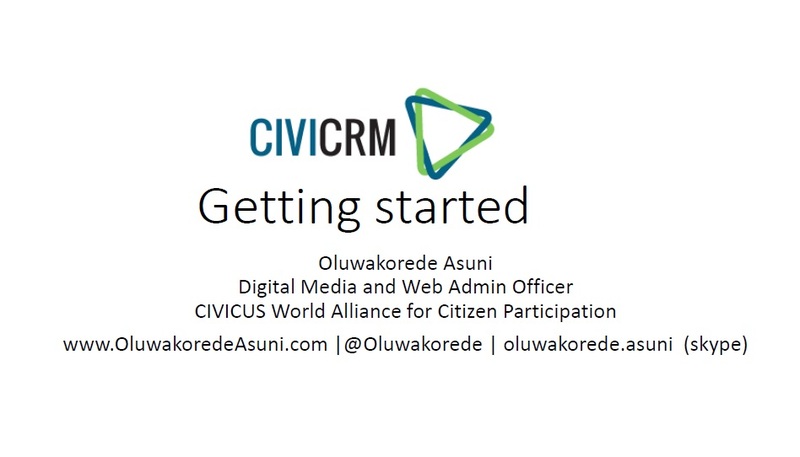 On Thursday 29 May 2014, at 5:00 PM – 7:00 PM SAST/CAT, Oluwakorede Asuni will host an African Round Table discussion with a panel of end users, developers and consultants who have used or currently uses CiviCRM in their work and will discuss the adoption process for two international non-profits, who have recently adopted CiviCRM. Download my slides here !